The Communion Veil: "If Catholics New What They Truly Are...."
St. John Vianney once said, "If a Priest knew what he was doing, he would die." This is true. But if applies to the priest, it also applies to us. If a Catholic knew what they were they would almost die of fright. At the Holy Mass, as we take the Holy Eucharist we are standing before the tabernacle, the seat of Judgement, for Christ is truly present. We bow, we put forth our hands or our tongue to take into ourselves what is most Holy, for their is nothing more holy or pure that Christ himself. As we partake of what is most holy, we place in our book of life an act that we will have to give an accounting for. If we have taken our Lord into ourselves in an impure state, we will see this event, not as we see it, but through the eyes of the Lord...a view from the tabernacle. So many in life say, "Who will see this? ", but God sees all, especially the heart. There is no greater self deception than the soul who thinks they can go to the Holy Eucharist without regular confession. God is constantly calling us to Him, we have a responsibility to present ourselves to the Lord properly dressed, and there is no greater place to clean our garment than the confessional. God is perfectly just. When the oxen stumbled Uzzah reached out and took hold of the Ark of the Covenant. Because of this act of irreverence, Uzzah died on the spot. The Jews faced death for breaking God's commands, but if we do irreverence with the Holy Eucharist we are under judgement and possible penalty of something far worse...the "second death...or hell." How the demons will torment a soul that has died in unrepentant mortal sin that has unworthily taken the Holy Eucharist! When we receive the Holy Eucharist we receive, strength, nourishment, steadfastness, conviction of heart or our sinfulness, His word to carry forth, and the armor to defend that word. 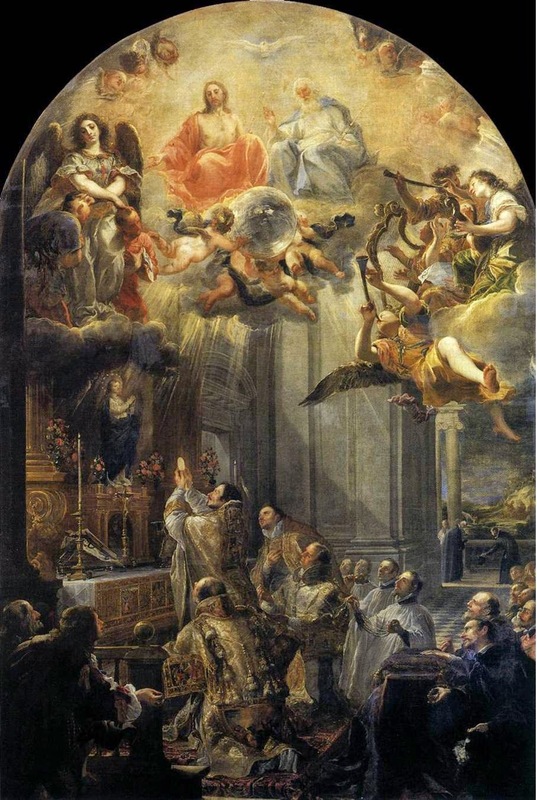 In the Holy Mass, the prayer is the opening of the gate to the Father. We hear the word and are strengthened with great joy! Then when the Priest brings us Jesus to the Altar by saying those holy words of consecration, this is when the battle begins. Catholic do you now know who you are? You are called to battle, and when you receive the Holy Eucharist, you are getting your weapons and armament. Do you know the battle you are called when the Lord on the altar is offered to the Father? This is the moment of petition to the Lord for the conversion of souls, especially the blackest of hearts. Not a war cry, but crying of tears of petition for the lost. Do you understanding what is happening at this moment? At this moment the heavens are opened and the throne of God is open to the petitions of any who would offer their whole self to the Father so that souls not be lost. You, Catholic, you are called to make this petition, at the moment of offering to the Father, offer yourself, your heart, all that have, nor for you, but FOR SOMEONE ELSE! This is why YOU are Catholic!! Not for yourself, BUT FOR THE OTHER! The Catholic is the front line in the battle for the lost. He has called you to the battlefield, for no other faith on the planet has the weapons that we have to beg God for the conversion of the blackest of hearts. I will tell you the truth, the state of souls in the world is very bad. Few are on the path of righteousness. The situation is dire, and although no soul can do anything 'for' God, because of His divine nature. However we can do all that we can for the lost souls that He loves in pouring ourselves out for them. There are lost souls in every faith on the planet, but we are the ones that have access to a direct petition to the throne of God for them! At our judgement we will be shown truly what the gifts we have been given to bring souls to Him, we must use them well. Join the fight for the lost! Their souls are worth it.